For the garden-loving homeowner, mature trees cause a conundrum: no one wants to remove a stately shade tree that took decades to mature, but trees are sun and moisture hogs that won't share their turf with just any plant. Gardeners sometimes compensate with a fresh planting of annuals each year, but this constant root disturbance isn't good for the tree either. Fortunately, there are a number of perennials that you can use to create an attractive and harmonious landscape under a tree. The heart-shaped leaves with contrasting white veining catch the eye of many gardeners with shady lots, but the cloud of sky blue flowers that Brunnera macrophylla produce in the spring is the icing on the cake. 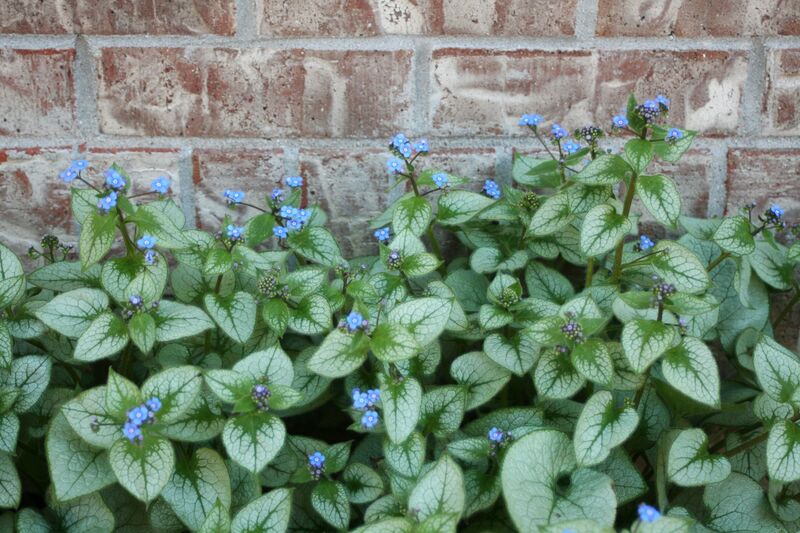 Besides being perennial stalwarts that bloom reliably in zone 3 regions, the Siberian bugloss will slowly form a colony of plants that you can use to populate the landscape under the tree, or transplant to other parts of the yard. As a native plant, the wild ginger is a ground cover that thrives with little care. Spring flowers are inconspicuous, but the heart-shaped foliage is attractive in its own right. Rural gardeners will appreciate the deer-resistance of Asarum canadense. Wild ginger is best grown without neighboring plants, as it tends to outcompete others in the landscape. A bonus to wildlife gardeners is the pipevine swallowtail butterfly that will seek out wild ginger plants to lay its eggs upon. Lily of the valley is a tough little plant with a sweet spring fragrance. The tiny bell-shaped flowers look like they belong in a fairy's landscape, but Convallaria majalis is a formidable ground cover that can quickly fill in any blank spot in the garden, including the thin, hard soil under established trees. For something different, look for the rosea form, which produces pale pink flowers. Dicentra plants provide textural interest in the landscape even when not in bloom. Finely divided leaves are a delicate backdrop to the pendulous pink heart-shaped blooms that give the plant its name. In hot weather areas, bleeding heart plants can act as ephemerals, which means they enter a period of dormancy in hot, dry conditions. If this leaves an undesirable gap under your tree garden, add a bird bath as a placeholder. Another winning native for the understory of your mature trees, Tiarella cordifolia blooms its heart out for six weeks in the spring. The rest of the time, you can expect your healthy plants to be busy spreading by runners to form an attractive (but not invasive) clump of plants sporting lobed leaves with red veins. Foam flowers do appreciate moisture, so if your tree canopy is dense enough to act as an umbrella, you should irrigate plants with an inch of water per week. The hosta is ubiquitous but never bland; the explosion in breeding efforts means you can populate the garden under your trees with mammoth or teacup specimens, gold foliage or blue, and broad leaves or narrow ones. Hostas are a very long-lived plant that grows and multiplies slowly over the years. Although they do tolerate drought, you will find that water is like fertilizer to a hosta: with plenty to drink, the plants will achieve their greatest potential. Vinca minor plants are aggressive enough to become somewhat of a pest in a mixed planting garden, but if a tough plant is what you seek, then periwinkle will satisfy that need. The plants provide excellent erosion control, filling a niche under trees where nothing else seems to grow and the soil is always washing away. Vinca plants will grow in dense shade, producing pretty blue flowers late in the spring. In a world of green ferns, the silver and pink fronds of the Japanese painted fern is a lovely departure. Although shade lovers, the coloration of the Japanese fern is most vibrant in dappled shade. Like all ferns, the Japanese fern needs regular moisture to thrive. A three-inch layer of mulch will benefit both ferns and trees by suppressing weeds and conserving moisture. If the soil beneath your tree is loose enough for digging, add some spring-blooming bulbs for a spring show that will increase in size each year. 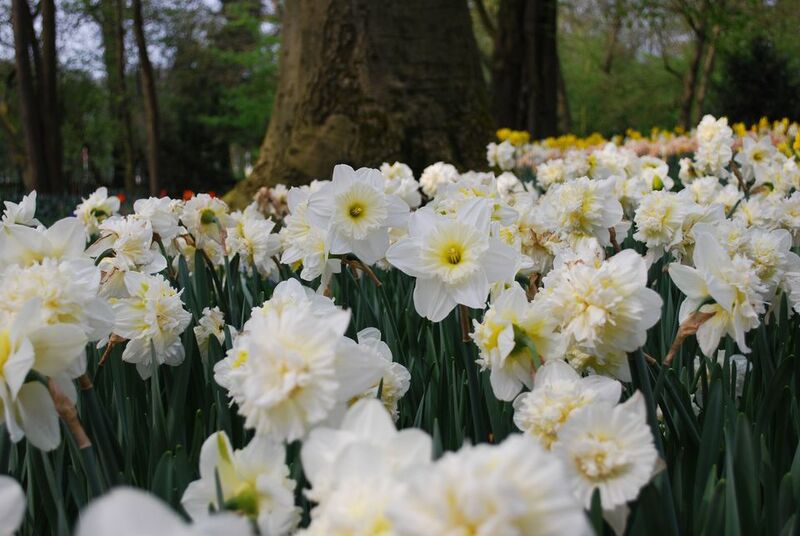 The Narcissus group of bulbs do need sunlight to get the energy for future blooms, but by planting early blooming varieties under deciduous trees you can satisfy that need before the trees leaf out. Plant bulbs at least three inches deep any time in the fall before the ground freezes. Do You Mean Business When Tackling Garden Bugs? Then Neem Them! When is the Best Time to Prune Magnolia Trees?